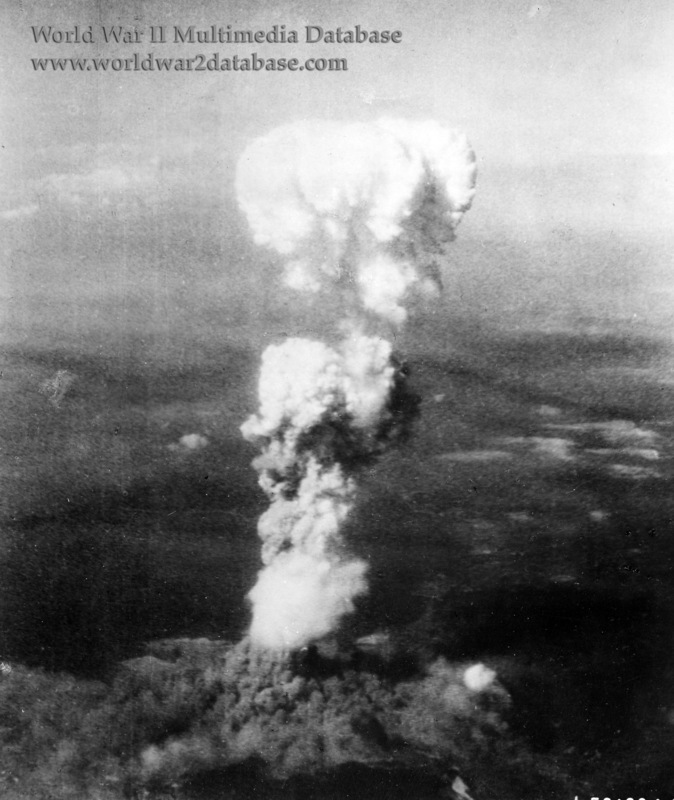 Explosion of "Little Boy" Atomic bomb on Hiroshima. For the strike, four 509th Composite Group aircraft were used. Straight Flush, piloted by Major Claude R. Eatherly (B-29-36-MO 44-27301, victor number "Dimples" 85) was assigned to weather reconnaissance. The Great Artiste, piloted by Major Charles W. Sweeney (B-29-40-MO 44-27353, victor number "Dimples" 89) carried blast measurement instrumentation, dropping four canisters of radio measurement equipment. Necessary Evil, Captain George W. Marquardt (B-29-45-MO 44-86291, victor number "Dimples" 91) was assigned to strike observation and photography, including a Fastax Camera that shot 10,000 frames per second operated by Physics Professor Bernard Waldman. Enola Gay, piloted by Colonel Paul W. Tibbets (B-29-45-MO-44-86292 Victor 82)	delivered the bomb. Several fixed "official" cameras were mounted on the planes, and film cameras in several planes. The 509th's photography officer, Lieutenant Jerome Ossip, asked Enola Gay's tail gunner, Technical Sergeant George R. "Bob" Caron, to carry handheld a Fairchild K-20 Camera. After the mission, Ossip developed the photos, but found that the fixed cameras were unable to record anything, and Waldman's film was mishandled in developing. The last camera, Caron's, was able to take this photo. Another handheld 16mm film camera on "Great Artiste" captured the only known motion film of the explosion.